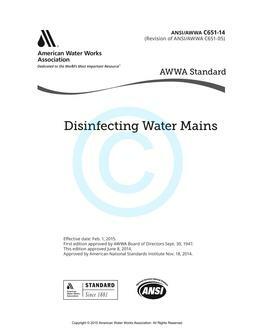 This standard describes essential procedures for the disinfection of new and repaired potable water mains. New water mains shall be disinfected before they are placed in service. Water mains taken out of service for inspection, repair, or other activities may or may not require disinfection and sampling, depending on the risk of contamination. This standard describes the process for evaluating the risk under different conditions. The purpose of this standard is to define the minimum requirements for the disinfection of water mains, including the preparation of water mains, application of chlorine, and sampling and testing for the presence of coliform bacteria.